5 Concealers Worth Every Penny. | By Millie. Urban Decay Naked Skin Concealer: This is one I have repurchased a few times and never fails me. It's a really nice creamy formula which is hydrating and long-wearing. This has been super raved about and for good reason, it covers really well, without looking cakey and dry. It's a great all round concealer so if you're looking to invest in just one, this is the one I would choose. The applicator makes it really easy to apply and it's super blendable too. MAC Pro Longwear Concealer: This is a bit more heavy duty than the Urban Decay one, it's great for concealing around the face. It's very long wearing as the name would suggest, but I don't find it looks too heavy on the skin. I have this is a couple of shades lighter than my skin so I can use it to brighten under the eyes. If you suffer with dark circles, this will be a great one to pick up! The only thing that annoys me with this is the pump, a little goes such a long way and I feel it always disperses too much product. Bobbi Brown Creamy Concealer Kit: This is another high-coverage option for those of you who want to correct those blue tones under the eyes. This handy kit comes with a concealer and a powder which both perform beautifully together. This is the only concealer I get on with which is in a pan. It's a fairly tacky consistency, but I actually love that as it stays put all day. This is also great for for pin point concealing as it's very full coverage. If I'm having a notoriously bad under-eye day I can always rely on this. Charlotte Tilbury Mini Miracle Eye Wand: I do love a good two-in-one product, so it's no surprise I get on with this. If you're looking for a light weight concealer which is going to correct under the eyes and help to brighten, this is great. It comes with pearlescent eye cream on one end, which hydrates and plumps, and a salmony corrector shade to conceal. This is great for those of you who don't wear a lot of makeup, but still want to correct under the eyes. 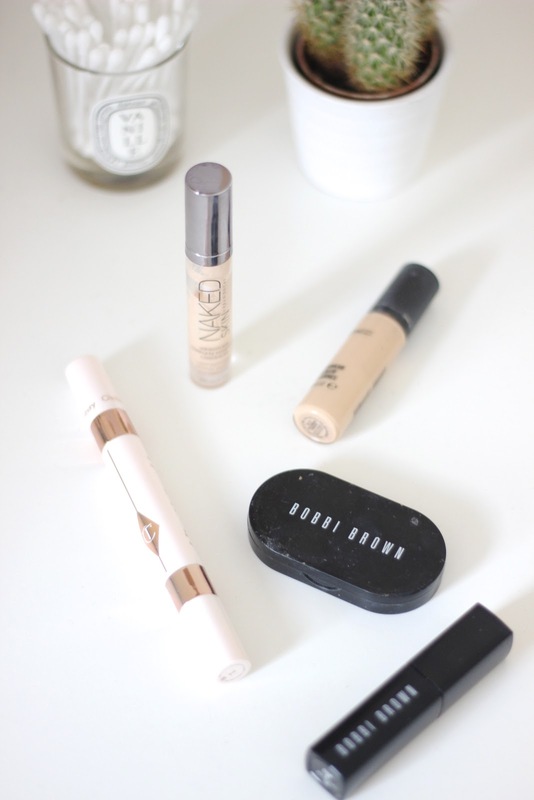 Bobbi Brown Intensive Skin Corrector: Bobbi Brown nail it when it comes to concealers, so yes, this is the second one I'm loving. This is a great light-weight corrector option, perfect to layer underneath another concealer. This is very hydrating and sits beautifully under the eyes. The peachy tone really helps to offset the purple/blue tones you may get under the eyes. What concealers are you loving at the moment?